My Kitchen Rules’ Kate and Nikki instant restaurant was on MKR tonight. Find their scores and how they were scored. Their instant restaurant was called “Sassy”. This is the last instant restaurant for this round and one team will be eliminated. For entree, Katie and Nikki made Nikki’s Croatian Hot Pot with Homemade Sausage. The sausage was a Cevapi. 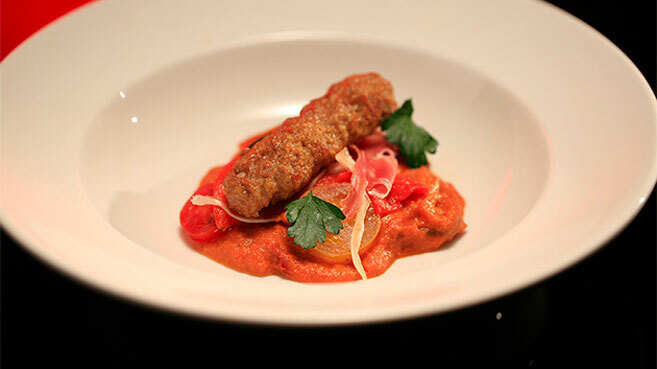 The team used roast capsicums from a jar as a “garnish” but used a lot of it. It wasn’t a “traditional” hot pot, Nikki had made the recipe herself with “traditional” flavours. Colin said he was a “little bit confused”. He thought the dish was a more like a “puree with a sausage”. It had a lot of garlic in it and he questioned the red pepper. It wasn’t what he expected as a hot pot usually has meat cooked in a stock and the Cevapi (sausage) needed more fat and was a bit dry. 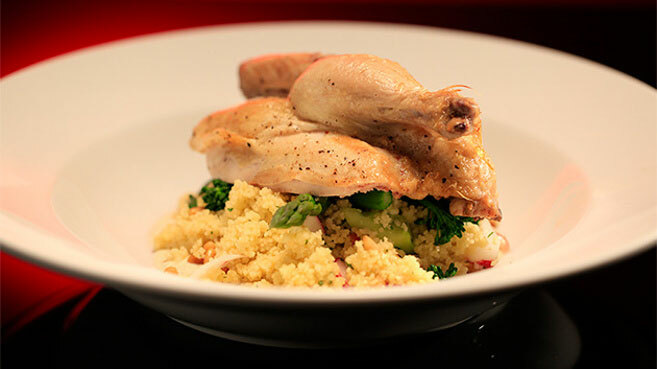 For main, the girls made a Spatchcock with Pomegranate Salad and Couscous recipe. They had some issues with cooking the spatchcock, they didn’t want to overcook it and had to check it and put it back in the oven. Colin said the spatchcock was cooked perfectly. He said it was a big step up from the entree and the yoghurt and cous cous was good. Katie and Nikki Spatchcock Pomegranate Salad and Couscous. Source: My Kitchen Rules Website. For dessert, Katie and Nikki made a Deconstructed Lemon Tart recipe. They had some issues with their sorbet machine. It wasn’t churning and they thought they broke it. Eventually they figured out that one part was around the wrong way. Colin said it was no “oil painting”. He said it was missing a lemon punch. He liked the sorbet and the crunch element was ok. 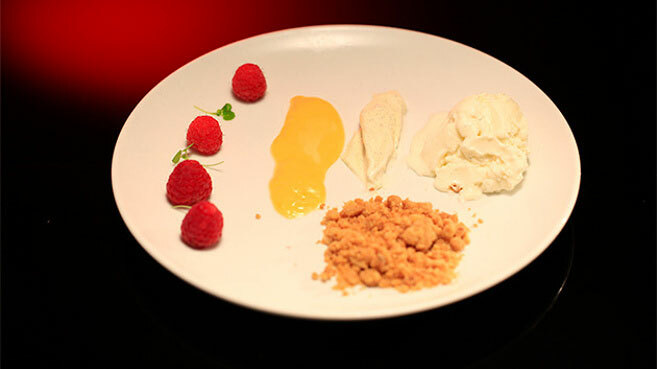 The contestants thought the flavours were ‘lovely’ and the sorbet was delicious.